Heretofore, SoundCloud’s revenue was derived primarily from its Pro accounts and private funding. But beginning today (Aug. 21), the company has announced a three-tiered monetization strategy that will introduce advertising to the platform for the first time, as well the news that SoundCloud has received more than $100 million in funding since its 2007 launch. Because good things can never last. I hope everyone else experienced the McDonald's pop-up advertisement upon visiting the Billboard article. Perfect. I am trying to temper my knee-jerk reaction of "Well, I guess I'm never using soundcloud again" with some naïvité, and hope that this comes out as a net positive for non-label users. However, this leaves a taste in my mouth more bitter than anti-depressants. I gave them my $20/year for a Pro account. I wanted to believe that enough people could recognize that what Soundcloud was doing for both producers and consumers was grassroots and special enough that it warranted support sufficient to meet its budgetary needs. It's more convenient for me to upload a track to Soundcloud and check the mix in my car, office, or wherever than to physically connect my iPhone and then deal with iTunes. Even using my Soundcloud "likes" playlist is easier than going through iTunes. I imagine that the ease of ultilizing Soundcloud for my personal uploads won't change, but consuming other artists' content will, and it shall become increasingly complex for increasingly popular artists. We seem to have built this internet business model that begins with providing a service superior to others in the same field, establishing a large user base, and then cashing in on your dominance (Facebook, YouTube, Google). I think people are starting to get tired of it. The examples that I listed managed to monetize successfully, but as the billboard article mentions, monetizing without doing your homework can lead to the destruction of your service... case in point: the popping of the dot-com bubble. I haven't formulated some magic alternative business model capable of providing a challenge to the current modus operandi, but I hope someone does. I'm not jumping ship just yet. 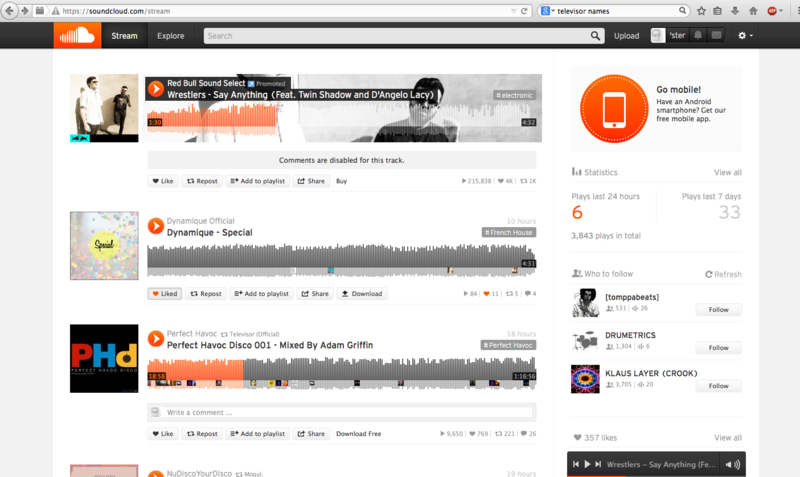 It will be interesting to see Soundcloud's implementation of these "new features". Like yourself, my reaction is overwhelming pessimism, but German software and business ethics are typically some of the best you could hope for. This is now a diary. A diary of how SoundCloud slowly, cleverly, begins shitting on accounts who aren't corporations, regardless of if you've payed them or not. Until today, only artists or users you had specifically followed contributed to your feed. Users previously received a small "promoted" plug on the right panel in the "who to follow" section. Now, promotional groups can apparently push their tracks directly into your feed. And WHO WOULD HAVE GUESSED... comments (and comments exclusively) were disabled for the track that is being forced down god-knows-how-many's throats! Oh, it's going to get worse, don't you worry. I'm bending over to grab my ankles. Cloud Flipper is your friend. You're not wrong, I see the utility, but the very act of requiring installation of a 3rd party software adds a layer of complexity no one wants to deal with. Additionally, to get "the best" RSS reader, I'd have to shell out five bucks. Even though I think the interface isn't the best, it looks like Bandcamp may be the best option for now. *Apparently it's mostly built with Go, a C-based coding system, and Ruby on Rails. Then compiled into HTML, I guess. Programming noob here. I like Liferea and Newsbeuter, both of which are free.